About Us – REM Company INC. It all started at a restaurant in Lexington, then moved to the kitchen table of Bob and Carol Moore’s apartment. Later it overtook their garage and their barn. Now, some 40 years later, the Moores have grown their business into a booming enterprise housed in a 15,000-square-foot building with about 40 employees. 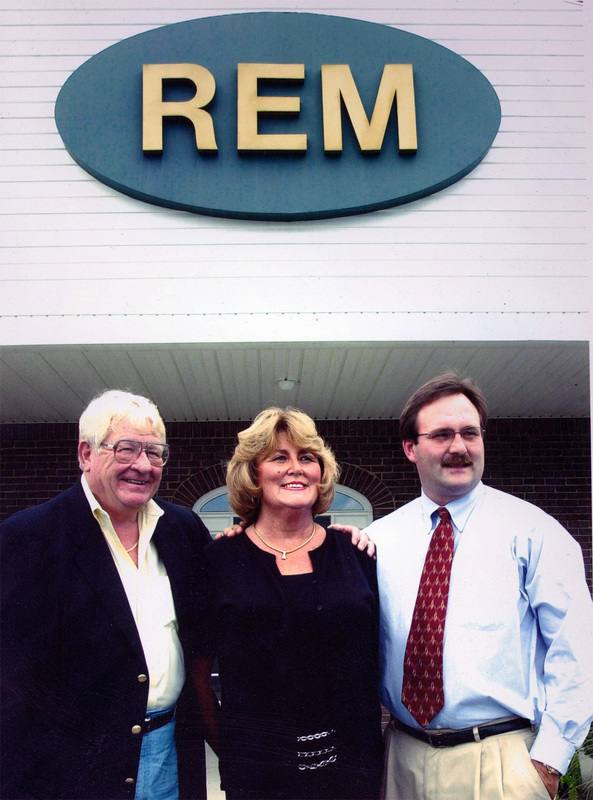 The WoodfordCounty couple, owners of REM Company Inc., a regional distributor of UniMac industrial laundry equipment, grossed more than $7 million last year and celebrated the company’s 20th consecutive year at the top of its class in sales and services. Versailles-based REM sells, installs, services and repairs industrial washers — some of which hold up to 800 pounds of laundry, along with dryers, ironers and other laundry equipment for hotels and motels, schools, jails, sports teams, horse farms, nursing homes and car washes in Kentucky and Tennessee. The company also designs industrial laundry operations. Bob Moore was a life insurance salesman when he first heard about the business from a salesman he met at a restaurant in Lexington in the late 1960s. At that time, the industrial laundry equipment sales business, especially in the hotel-motel market, was starting to pick up with the introduction of no-iron sheets. The sheets opened a market for laundry equipment sales to establishments that wanted to do their laundry on site to save money. The couple opened up shop with a typewriter and a calculator on their kitchen table, where they churned out contracts, held business meetings and sold and ordered products. Later, when they moved to a farm in WoodfordCounty, the operation overtook their home. They stored laundry equipment in their barn and set up a parts department in their garage. Then the couple moved their office to a small outbuilding with a dirt floor. About that time, they hired their son, Mark Moore, now the vice president of the company, and several other employees. “Eventually, after about 20 years, we’d used up every nook and cranny of my house and barn and we’d added some employees, so we were literally splitting at the seams,” said Carol Moore. Finally, in 1999, the couple bought a few acres of land and built their current office, warehouse and service center. But the couple haven’t forgotten the lessons they learned during their growth period. Lesson No. 1: the value of customer service. “We work just as hard to keep a customer as we do to get them,” said Bob Moore, who once spent Christmas Eve washing linens for a customer who didn’t have staff trained to use the equipment on hand. Evidence of their commitment to service shows in their client list, which includes many of their early customers like Glenn Cravens, owner of Quality Inn on Newtown Pike in Lexington. Lesson No. 2: Treat employees well. “Working in such close quarters in our earlier days made us all closer, ” said Carol Moore, who noted that her husband takes time to have a one-on-one chat with each employee once a month to address any concerns. Mark Moore, the couple’s son who is in charge of sales and new products, expects REM to expand as its products gain popularity and more hotels, motels, nursing homes and jails are built. Already, demand is increasing for the company’s more high-tech equipment, including a new washing machine that uses ozone to sanitize and disinfect, thus saving water and energy . “We’ve come a long way from that old kitchen table,” Bob Moore said.